Set during the rise of the Roman Empire and their invasion into Europe during 50 BC, the classic setting for the Asterix and Obelix cartoons and comics, all across Gaul the primitive villages have been taxed by their new would-be rulers and those who stand up against them have been razed to the ground. All that is left is one long village that simply won’t surrender, a thorn in the side of the Roman Empire and a nuisance to Caesar himself, and it is here that the resistance shall begin. Taking in the refugees from the pillaged villages you will rebuild, re-arm and retaliate! The game begins with an undeveloped village that has seen better days and the tutorial will walk players through the first steps needed to recover resources, clear village plots and reconstruct new buildings within the wooden palisades of the village. Offering their guidance to begin with is one of the most famous Gauls of them all, Asterix himself, accompanied by a number of village elders, chieftains and other notable characters from the series. The pace of the game is easy to take in making this casual browser game for all ages and as players level up new features are unlocked to prevent new players being overwhelmed with the various systems. Tutorial takes the form of different tasks/missions that are asked of your warrior, but these continue throughout the game, continuously encouraging you to perform the next task which may be constructing a certain building, gathering particular resources and even attacking nearby Roman legionnaires. With each task that is completed the player will earn resources and experience points which will go towards levelling them up. Increasing your level has two major benefits, firstly it instantly gives players Roman Helmets, the premium currency in game that can also be purchased with real money, and also helped players meet prerequisites needed to unlock certain building and unit types. 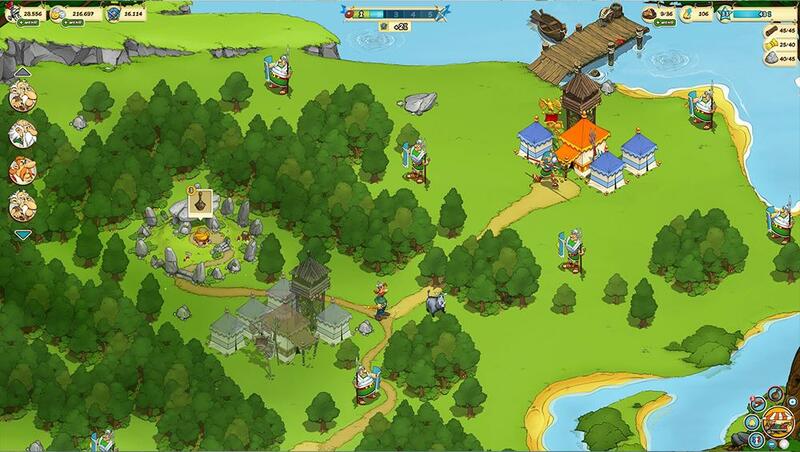 Construction of buildings is simple in nature, scrolling around the map the player simply needs to choose a plot within the village boundaries, which will often need to be cleared of debris, and then purchasing one of the available buildings from their list. Constructing buildings will take time, but this can be rushed by spending the Roman Helmets premium currency, and also take up valuable resources needed to create just about everything in the game. Resource gathering happens in a number of ways outside of completing tasks, players can actively leave their village and gather resources around the area with everything from mining rocks, chopping lumber, harvesting farms, fishing and also tracking down wild boar. The harmony of your village will last that long and at some point you will have to get your hands dirty and fight the enemy head-on, either going out and actively fighting nearby Romans or defending your village against any heading your way. Players are able to equip their individual villagers with various weapons and armour that will increase their individual strengths level, and when an attack is declared on an enemy unit the player is able to choose which of their villages they wish to participate in the fight. When a fight is initiated the player is able to see their chance of success which changes depending on which villagers they are sending into the battle, determined by each villager strength, and occasionally players will even get the chance to fight with Asterix or Obelix in their party which will always be a guaranteed victory. Once the fight begins players will see an animated cartoon fight between the villagers and Romans in the form of a scuffling cloud of dust with fists flying from within.